The incidence of serious morbidity and mortality associated with administration of sedative drugs, deep sedation and general anesthesia are not known due to lack of prospective data collection and the failure of state boards and liability insurance companies to make closed claims data available in redacted form. Information in the public domain of deaths in dental offices, however, provides evidence of the incidence of cases and the characteristics of factors associated with serious adverse outcomes. A search of the internet using the term ‘deaths in dental offices’ yielded 40 cases of serious morbidity or deaths that were associated with anesthetic and sedative procedures. The majority of deaths were associated with general anesthesia and parenteral sedation; only 4 deaths were associated with oral/enteral sedation (N=2 chloral hydrate alone and in combination with other drugs, N = 2 triazolam). These data do not support attempts to further regulate the use of benzodiazepines for oral/enteral sedation but do suggest the need to re-evaluate the risks of deep sedation/general anesthesia provided to dental outpatients. The drug classes most frequently reported in cases of serious morbidity and mortality include opioids, propofol and combinations of 2 or more drugs with a benzodiazepine. A group of scientists, academics, and dentists issued a 7,000-word FACT CHECK of the American Dental Association’s official ‘Frequently Asked Questions’ pertaining to Resolution 37, a proposed revision to the ADA’s Sedation and Anesthesia Guidelines. Delegates to the ADA’s House of Delegates are scheduled to vote the resolution up or down at the group’s annual meeting which will be held October 20-24 in Denver. The official FAQ was released by the ADA’s Council on Dental Education and Licensure (CDEL), which drafted ADA Resolution 37 and is advocating for its adoption. If approved by ADA delegates, Resolution 37 will dramatically revise the ADA’s recommended guidelines that govern the use of sedation and anesthesia, as well as related training requirements. The entire 7,000-word FACT CHECK is available to download here as a PDF. There is also an abbreviated SUMMARY available for download. The FACT CHECK, a collaboration reflecting the input of more than a dozen ADA members who are independent of CDEL, responds to each of CDEL’s 15 assertions. An unedited replay of the live October 10th National Dental Town Hall teleconference on ADA Resolution 37 is now available at: http://tinyurl.com/Dionne-Replay. A transcript of the panel’s presentations and discussion is available at: http://tinyurl.com/Dionne-Transcript. The event was organized and hosted by Dr. Raymond A. Dionne and featured: Dr. Michael Edwards, Dr. Sharon M. Gordon, and Dr. Robert M. Peskin. Proposed Guideline Revisions for Dental Sedation and General Anesthesia: Why Target the Safest Level of Sedation? According to Dr. Dionne, since 2000, more than 22,000 dentists have been trained to provide conscious sedation to their patients for use in anxiety control in outpatient settings. “If implemented, the proposed revisions of the [ADA] guidelines will not appreciably improve the safety of enteral sedation but may eventually limit the ability of general dentists to provide sedation services to patients who would otherwise avoid restorative and preventive dental procedures,” Dr. Dionne writes in Compendium. 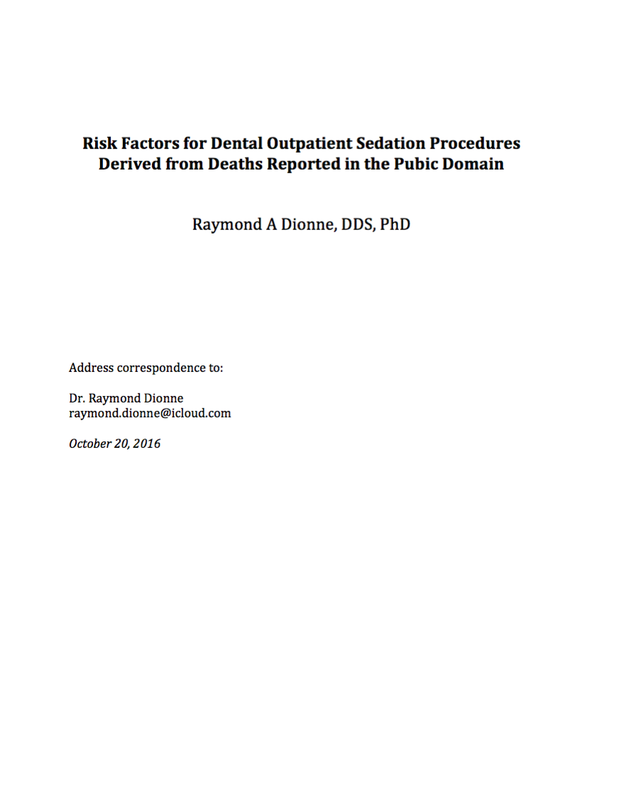 Discussion of all potential risk factors that affect the safety of dentists providing anesthesia and sedation in outpatient settings is beyond the scope of this article, but it should be recognized that dictating clinical practice based on the concept of MRD and arbitrary assignment of training hours and clinical experiences are only a few of the many factors that determine the overall risk. Recognition of the need to adequately inform patients of the incidence of death associated with various types of anesthesia and sedation, for example, is now being recognized through legislative efforts in California and Florida and in the insurance liability profession.37 The dental profession and the public would be better served by development of an evidence-based comprehensive strategy to optimize the safety of outpatient anesthesia and sedation rather than attempting to restrict the use of enteral sedation through the proposed revisions to the ADA guidelines. Dr. Dionne, a a research professor in the School of Dental Medicine at East Carolina University, is the co-author of Management of Pain and Anxiety in Dental Practice and has published more than 100 scientific manuscripts related to his lifelong work on pain and pain control. An audio reply of the briefing is available to stream or download here. Previously, Dr. Dionne served as Chief, Pain and Neurosensory Mechanism Branch at NIDCR (National Institute of Dental and Craniofacial Research) and Scientific Director at the National Institutes of Health‘s (NIH) National Institute of Nursing Research. The editors of GetTheScience.com invite the submission of additional published Journal articles related to oral sedation. Send the articles (as PDFs) or article references to: Editor@GetTheScience.com. Dionne RA, Gordon SM, McCullagh LM, Phero JC: Assessment of clinical needs for anesthesia and sedation in the general population. J Am Dent Assoc 1998; 129:167-173. Ehrich DG, Lundgren JP, Dionne RA, Nicoll BK, Hutter JW: Comparison of oral triazolam, diazepam, and placebo as outpatient premedication for endodontic patients. J Endodontics 1997; 23:181-184. Berthold CB, Dionne RA, Corey SE: Comparison of sublingually and orally administered triazolam for premedication prior to oral surgery. Oral Surg, Oral Med, Oral Pathol, Endo 1997; 84:119-124. Kaufman E, Hargreaves KM, Dionne RA: Comparison of oral triazolam and nitrous oxide to placebo and intravenous diazepam for outpatient premedication. Oral Surg, Oral Med, Oral Pathol, 1993; 75:156-164.